Details The second SciPy India Conference was held from December 13th to 18th, 2010 at IIIT-Hyderabad. 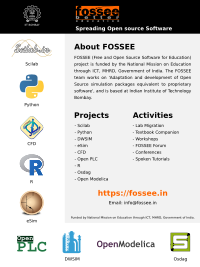 Scipy.in is a conference providing opportunities to spread the use of the Python programming language in the Scientific Computing community in India.One of the goals of the conference is to combine education, engineering and science with computing through the medium of Python and thereby extrapolate on how powerful Scientific Computing is in various fields and among different communities. In the second conference of SciPy India the international keynote speaker was Perry Greenfield. The other speakers were Fernando Peréz, Stéfan van der Walt, John Hunter, Satrajit Ghosh. In the second year, 2010 we had 24 submitted talks and a total of 31 talks in conference.